Drivers need to be alert and cautious because moose will be on the move, according to the Vermont Fish & Wildlife Department. Moose are more likely to be crossing roadways at this time of year, especially after dark or early in the morning. The peak of their breeding season is late September and the first two weeks of October. Moose are a threat to motorists, but there are measures you can take to avoid hitting them, according to Fish & Wildlife. Always be aware of the danger—moose cross the road randomly, as well as at their regular crossings. 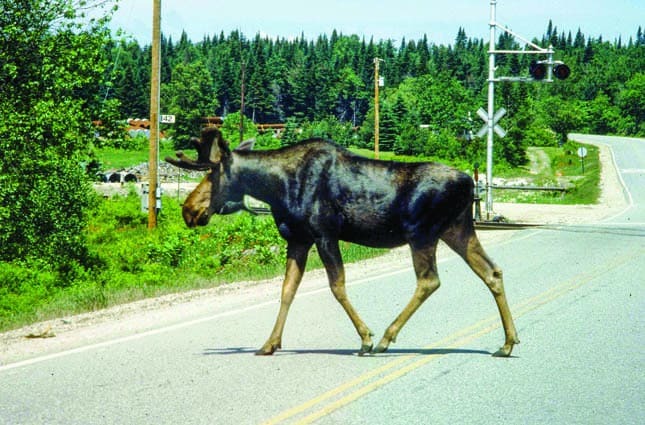 Increase your roadside awareness and reduce your speed when you see “Moose Crossing” signs along the highway. When on secondary roads, the recommended speed is 40 m.p.h. or less in these moose crossing areas. Drive defensively and don’t overdrive your headlights. Moose are more active at night and early morning, and they are difficult to see because of their dark color. If you see a moose ahead, slow down or stop. Trying to speed past them before they move can be a serious mistake. Moose are more likely to be crossing roadways at this time of year, especially after dark or early in the morning.